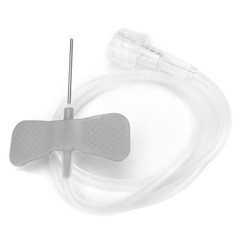 Sterile Exel Scalp Vein infusion set with 27 gauge, 0.75" needle with thin wall and no safety feature. 12 inch long tubing with grey wings and fixed wing hub with no port. Comes in a box of 50. Manufactured by Exel.